You must decide between central air conditioning and multiple split AC systems. Windows AC is not suitable for office space. Multiple split AC is ideal for an office with many rooms. Consider central AC when you want to cover an entire building. The installation charge is also quite high for a centralized AC system. 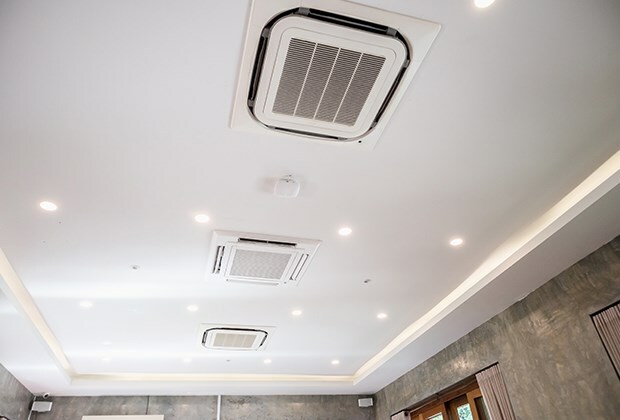 You can also get suggestions from AC dealers if you have any queries related to AC installation for various building types. Refer to the chart below to determine the size of the AC for your office room. The above chart indicates the AC size in relation to the room area. Other factors that need to be considered are the weather condition at the location of your office, electronic devices running inside the workspace, and the number of people in a given workspace. The right type of AC means a combination of different kinds of AC. If you are in doubt about your requirements, ask an expert for cooling solutions to help you get the best deal. Always opt for any maintenance package the dealers offer. It ensures that the ACs keep performing at their optimum levels. As office spaces are more prone to bacteria growth, an additional dehumidifier prolongs the longevity of the AC in office. Regular cleaning and replacement of filters, coils help the AC to run smoothly. A clean air filter helps reduce your electricity consumption by 5%. A dirty filter makes the AC work harder, increasing energy consumption. Checking for blockage in drain pipes can prevent water leakage. Also, keep an eye for smelly AC system. The air in circulation must be clean and free from pollutants. The operating system or temperature regulation should also be monitored to increase the efficiency of the staff. In the event of cracks or crevices, immediately address the issue. Boost the performance of the AC by fixing any building or electrical problems. If your budget is low, then get a 3-star rated unit that will effortlessly run for a few months. Reduce the usage of AC to the minimum hours required. It will not affect the level of comfort your employees will be getting. Always check for a programmable thermostat with different cooling speeds. An auto-power off puts the AC to sleep mode as and when the machine reaches the desired room temperature. This mechanism is highly energy efficient. The filter must be of superior quality. A good filter helps circulate cleaner air that is hygienic and must meet the required health standards. The superior metallic finish of the coil makes the evaporator rust proof and smooth. Also, the refrigerant used in the AC must ideally be R-410A. It does not affect the ozone layer and is environment-friendly. R-22 is another good refrigerant. Depending on the unit you are installing; you must make provisions to facilitate the process. If you are installing a window AC, then, choose windows you can easily block. For any split system or central air conditioning, choose the area for the outdoor unit. The installation process depends on the type of AC you choose. Make sure to check all the electrical requirements before operating the AC units. Check the wirings and ask the local electricity board if you feel, you might need more power. You might need to get stabilizers if your office locality suffers from drop or surge in voltage. If the AC is not properly installed, the units might end up consuming more power and you will have an exorbitant amount of usage to pay for. Consider Inverter options too. In a business space, any power interruption may result in loss of significant productive hours. Inverter AC prevents any kind of disruption. Higher the rating, lower will be the electricity bill. You can make a calculation of how much power the AC unit will be consuming and allocate the budget. Always choose the highest rated AC for best efficiency and savings. Similar to any other electronic device, an AC also comes with a warranty. The manufacturer warranty may cover 1 to 5 years. Make a note of what conditions are coming under warranty. Also, consider the maintenance required to make the warranty effective. Many AC companies allow an extended warranty against servicing fulfillment. You can activate the warranty from the purchase date or the installation date. Clarify which one applies to your AC system. If you are getting the AC installed by the dealer from whom you bought it, then do not open the packaging. In that case, if there is any missing part or the AC is defective, the warranty might not stand applicable. When patchy sweat or burning heat does not interrupt or bother the people working in an office environment, the employees will perform better. Air-conditioning is an investment that you must make to ensure the comfort of your employees. If your employees are happy, your business will prosper. Get in touch with the best AC dealers in Hyderabad, AC dealers in Mumbai, AC dealers in Ahmedabad.